Fish Roes	There are 5 products. Their preparation is similar to that of sturgeon eggs. There are different species of salmon. The most popular reference is CHUM. It comes from USA or Canada. The harvest season is from july to November. In Europe the size and appearance being more important, they prefer hard shell. The Japanese prefer the smaller grain soft shell type. (sushi grade) For fresh use only. 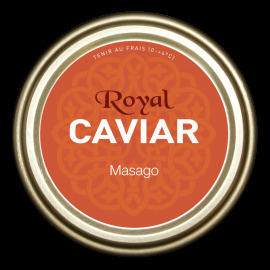 Soft shell and smaller grain size comparable to trout roe, very much appreciated by the connoisseurs for their taste and flavor. They surfaced only about twenty years ago into the market. France given the ideal climate, has a lot of trout farms. Very fine texture, size, natural taste… The trout eggs being relatively high-end, are an alternative to salmon eggs. or Tobiko Very popular in Japan, these eggs are a must! Tobiko is the Japanese word for flying fish roe. These eggs are small, ranging from 0.5 mm to 0.8 mm. The Tobiko is slightly larger than smelt eggs (masago) and way smaller than salmon eggs (Ikura). Their grains are crunchy under the teeth. The natural Tobiko flavored with wasabi (green), ginger (orange) or squid ink (black). or Masago Product of wild fishing in Iceland, massago is the capelin roe. Ideal for making sushi or sandwiches, their texture is crunchy. It can be flavored with wasabi (green) or soy (orange).